Each month, trade publication TPi (Total Production International) takes an inside look at recent and current touring productions, to reveal the details behind the staging of these - looking at how the tech teams behind each aspect sort out issues and ensure audiences get the best experience possible. As the world of concert staging develops, some incredible technical advances keep pushing the envelope of what's possible, making truly memorable experiences. The magazine doesn't just look at the visual aspect, but at the delivery of sound too. It's thankfully rare to have poor audio at a gig these days, with equipment getting smaller, more portable on the road, and higher quality. 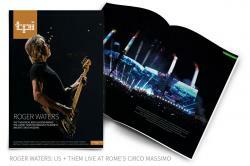 The September 2018 issue will be of particular interest to our readership: in it, there's a massive 16 page article looking at the current Roger Waters Us + Them tour, with additional pages of adverts from assisting companies involved in the tour. TPi: "There are few British rock legends who rose to fame in the '60s and continue to tour today, let alone with the magnitude and stamina of Roger Waters. Following an indoor arena tour which started in North America, the production then headed to Europe, via NZ And Australia, for the Lucca Summer Festival before upscaling further for Rome's Circo Massimo (Circus Maximus) and its audience of 65,000 fans. "The outcome did not only deliver awe-inspiring technology in a juxtaposing event space but was a team effort - delivered seamlessly in 36°C heat - led by a hearty dose of calmness and clarity. Read the full in-depth tech feature in this month's TPi front cover story." The good news for those who aren't subscribers to this magazine, is that it is available online through this direct link!